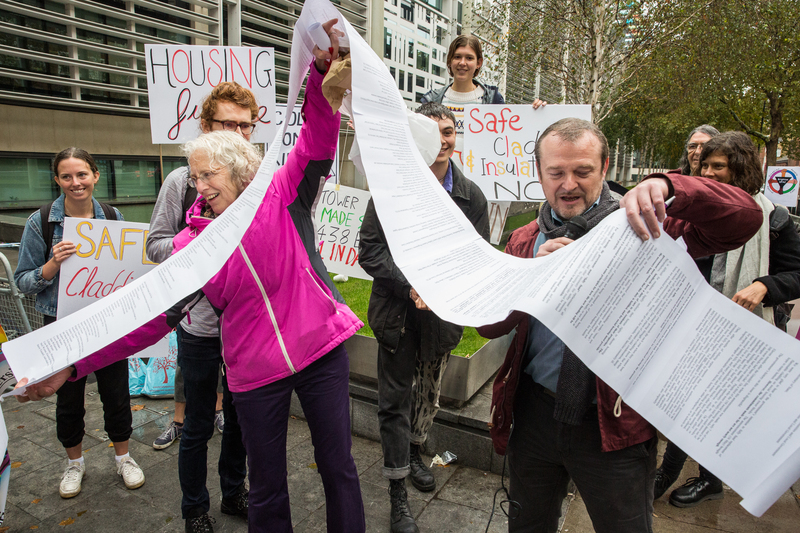 Sixteen months after the Grenfell fire, 50 people stood together in the the rain, outside of the Ministry for Housing, Communities and Local Government (MHCLG), to deliver an Open Letter that demanded safe and warm tower block homes. 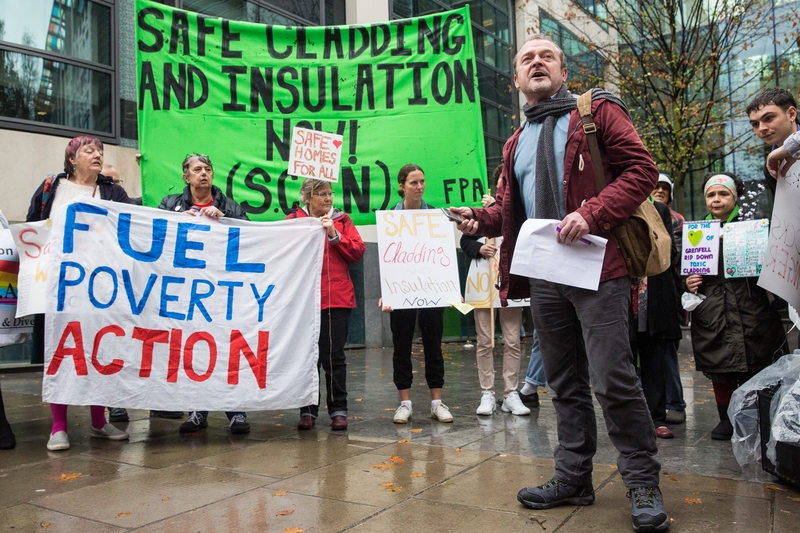 The demonstration was organised by Fuel Poverty Action (FPA). Many of those who came, spoke out. Speakers included residents living with Grenfell-style cladding, people from the Grenfell community, and supporters. The speeches covered a wide range of issues, including the plight of children at Grenfell, the needs of disabled people in high rise blocks, and the threat of climate change and associated extreme cold weather to residents whose insulation has been removed. The common thread of safe and warm homes tied it all together, and many, including the Fire Brigades Union, Unite Housing Workers and other major trade union bodies, pledged their support to the campaign for Safe Cladding and Insulation Now (SCIN). This support lays bare the outrage felt because thousands are still living in tinderbox homes or homes that are freezing, mould-ridden and expensive to heat when winter comes. When the speeches were through, the letter was unrolled. Now standing at nearly 150 signatories, which includes 28 MPs from four major political parties, 5 national trade unions, 20 other union bodies and branches, NUS, 5 councillors, 44 housing and Grenfell-related groups, 16 poverty and discrimination organisations, 15 environmental and anti-fracking groups and many others, the letter carried real weight. Three people living with Grenfell-style cladding and a member of FPA walked into the MHCLG to hand-deliver the letter. 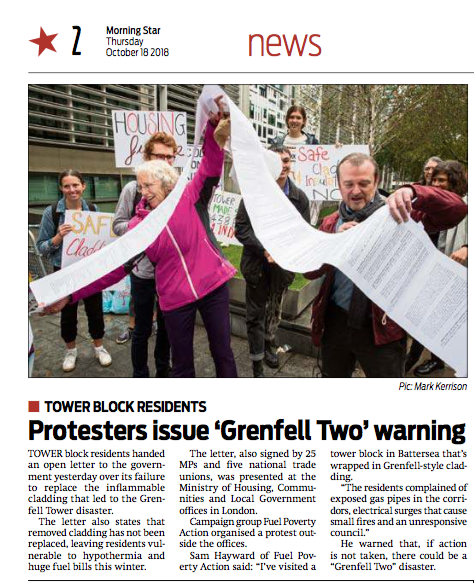 The group spoke with a civil servant from the department, who took down details of specific affected towers, listened to the grievances of the residents and promised that the letter would arrive on Secretary of State James Brokenshire’s desk that day. FPA are awaiting the promised swift response. 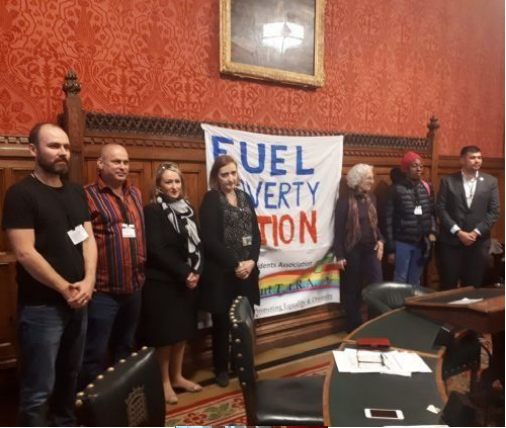 Following the hand-in, the demonstrators marched to the House of Commons and held a two hour long meeting, including Emma Dent Coad, the Grenfell MP, Rebecca Long-Bailey MP, Shadow Secretary of State for Business, Energy and Industrial Strategy, and Alison Stoecker, secretary to John McDonnell MP. Residents and MPs declared their commitment to the campaign and discussed how to – together – force action to ensure that residents are protected both from fire and from cold. The last event of the Day of Action – 17th October – was a crowded tenants and residents meeting called by Southwark Group of Tenants Organisations. Held to highlight the lack of accountability in councils and the way tenants organisations are increasingly disempowered, beaten down, and deprived of resources when they try to campaign for better housing conditions, the event echoed some of the demands of the Open Letter. As the Hackitt Review into the Grenfell fire acknowledged, it is residents who hold the key to housing safety. 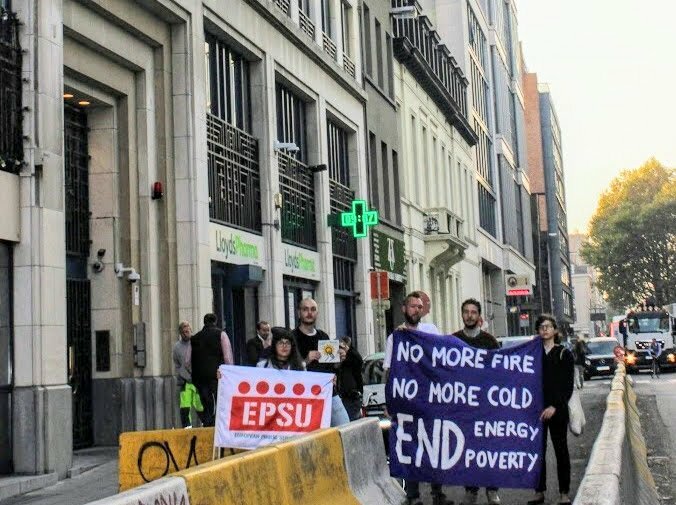 Whilst FPA and SCIN campaign supporters demonstrated in London, Right to Energy Coalition held a solidarity action outside of the British embassy in Brussels. Marking this as a transnational Day of Action and just one of many steps to achieve safe and warm tower block homes for all. Manchester Evening News and many many others! Next PostNext Government bows to pressure on leaseholders’ cladding costs! Now for protection from cold.